The Spoken Word Sylvia Plath CD has reached #1 in Audio Poetry and Drama on Amazon.co.uk. 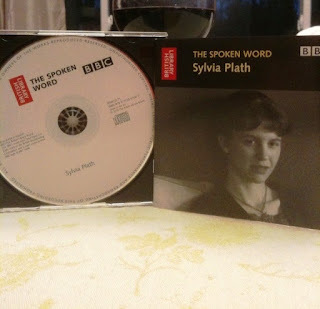 Poet, writer, and blogger P. Viktor has two reviews of the British Library's Spoken Word: Sylvia Plath CD. The first, posted on 26 April, is a review of the disc itself. Read "Sylvia Plath - The Spoken Word, Review." The second, posted today, is a more critical look at "Two of a Kind" & the marriage of Plath and Hughes. Read "Sylvia Plath - The Spoken Word: Why the Plath-Hughes Marriage Failed." Over at Amazon.co.uk, Cathy Earnshaw (love the name) gave a five-star review, too. The following is a review of the British Library's recent publication The Spoken Word and is written by Dr. Gail Crowther. First, there is the packaging. Slick hues of black and grey with dashes of red and yellow. The disc case sits comfortably in the palm of your hand. Turn it over to see the track listings, all the surviving BBC broadcasts from the years 1960-1963. Remove the booklet; a flash of yellow on the back page with the distinctive British Library logo. Open the first page and fall straight into Peter K Steinberg’s introduction. Sharp, authoritative and full of energy, he guides us through the contents of the CD, telling us what to listen out for, bringing alive the sound of Plath’s breath, the shuffling of her papers, the background sniggering of her interviewer as she makes another Esther Greenwood-like wisecrack. This introduction also prepares us for the sheer output and involvement that Plath had with the BBC in that three year time span. It was not just her own poems she read over the air but other people’s poems or interviews she gave and, in the final recording, a review of an American anthology by Donald Hall. Steinberg neatly lays out for us the chronology of it all, the developments, not only in Plath’s reading voice, but the way in which her writing style changed to accommodate the oral performance of her poems. ‘I’ve got to say them, I speak them to myself...I say them aloud’ (Orr 1966: 170). Steinberg describes how her 1961 reading of ‘Mushrooms’ ‘pours without blemish into the ear.’ He also offers evidence of Plath’s increasing confidence with the spoken word cataloguing how three different recordings of ‘The Disquieting Muses’ gradually become longer and slower, the final recording lasting almost half a minute longer than the first one made. Steinberg highlights that ‘these lengthening durations suggest not only increasing comfort with the poems, but also a greater patience in the way she sought them to be rendered’. There is little that can prepare you for the blast of Plath’s voice from the disc, and that, along with Steinberg’s intelligent introduction, is the great delight of The Spoken Word. The past’s ability to suddenly rear into the present as if it had never been away, is one of the most thrilling aspects of listening to these recordings. Although mainly an aural experience, Plath’s presence is also somehow palpable – you hear movement, breathing, sighs and papers. Her chuckle is very immediate. In the staggering live recording of ‘Tulips’ from the Mermaid Theatre in 1961, you hear a slight nervousness in Plath’s voice before she quickly regains composure and enters her stride. The sounds around the theatre are clear, people walking, moving and coughing. Again, there is an immediacy, as though it were live, here and now, as you listen. ‘What Made You Stay’ is another highlight in which Plath describes her experiences of being an American woman in England. This recording is of slightly poorer quality, perhaps as a result of being recorded on a piece of mobile equipment in her living room in Devon. Nevertheless, Plath’s wit and candour leap out. At times if you listen carefully – and Steinberg notes this in his introduction – you can hear the interviewer, Marvin Kane, choking on his laughter. Hardly surprising given her accounts of the British weather, seaside holidays in the rain, butcher’s shops and the bizarre choice of needlepoint in the first home she stayed in. Her bewilderment at certain English customs is the focus of the humour here, a sort of gentle trans-Atlantic culture clash. There are too many wonderful moments on this disc to list here, but apart from the above, some other highlights for me were the melancholic reading of ‘Berck-Plage’ and the very different sounding Plath of the ‘New Comment’ recording. This was, as Steinberg points out, a different direction for Plath as a critic and reviewer, and one in which she excelled. This disc is essential for many reasons; for those of us who love Plath’s work, for those who study her texts and, perhaps even, to open a whole new area of scholarship about the audio Plath, started by Kate Moses in Anita Helle’s book The Unraveling Archive. But most importantly this disc is for those of us who want to listen to Plath and what she had to say. It is the spoken word and Sylvia Plath speaks; clearly and boldly, straight to us. The new British Library Spoken Word CD Sylvia Plath is garnering much interest. 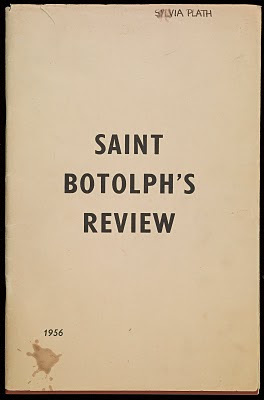 Concurrently, the British Library have announced the acquisition of Ted Hughes' copy of the Saint Botolph's Review, complete with wine stains from a Luke Myers bicycling accident! The news first appeared via the Herald de Paris in their article "Library Acquires Stained Ted Hughes Journal." This timing of this acquisition, which they've known about for sometime, is likely intentional as the Spoken Word CD includes Sylvia Plath and Ted Hughes in conversation discussing their lives together, how they met, etc.. How they met is the stuff of legend, captured with rapture by Plath in her journal the morning after. Helen Broderick, one of the archivists I envy the most, was charged with bringing order to the Ted Hughes papers acquired by the British Library in 2008, updates her Ted Hughes Archive Blog. The BBC also seems to have focused on the "Rare Ted Hughes Journal Acquired by British Library" angle. I can't blame them, it's pretty fascinating and I suspect we all have a bit of a fantasy or even fetish about this issue and the party and the meeting. At least I've got a bit of a facination about the Saint Botolph's Review. Likewise, Laura Davis at the Liverpood Daily Post writes of "Ted Hughes Journal Acquired by British Library." This article seems to have completely missed the CD. And this all stems from a British Library Press Release: "Saint Botolph’s Review: ‘an overture to the night and the party’ where Ted Hughes and Sylvia Plath first met." The Guardian contributes "Sylvia Plath and Ted Hughes Talk About Their Relationship," which is a nearly two minute clip from "Two of a Kind." Also, Alison Flood at The Guardian authors, "British Library Archive Throws Light on Hughes-Plath Romance." Lovereading.co.uk ran an article on Friday, "Ted Hughes Archive of Works Completed" by Jade Caulfield. While mostly about the British Library archive of Hughes, the CD is mentioned. The newspapers and internet sources have caught wind of the British Library's newest Spoken Word CD. Rachel Hayward at Cuture24 has the distinct honor of being the first news story I've seen on this new Sylvia Plath publication. Read her "Listen to Poets Sylvia Plath and Ted Hughes" here. The British Library has a nearly 8 minute podcast, too. Richard Fairman, producer of the Spoken Word series, discusses this enlightening CD which includes Sylvia Plath reading her own work and an interview with Plath and her husband, Ted Hughes, discussing their relationship and writing. Interviewed by Ellie Russell. The Spoken Word: Sylvia Plath is published today in the United Kingdom. If you haven't already ordered your CD, click here, and enter the voucher code BLPLATHBLOG to receive 10% off your purchase. University of Chicago Press will release the CD around 1 May (this does represent a slight delay based on previous blog posts & expectations). Click here to order from them (you will also receive 10% off). 20. The Surgeon at 2 a.m.
21. Surviving extracts from a recording made for, and partly used in, the programme What Made You Stay? The tracks are arranged in order of broadcast date. The CD includes a booklet with an introduction & detailed track listing, as well as other titles in the Spoken Word series that might be of interest to Plath scholars, readers, fans, etc. The cover image of Plath was taken by Rollie McKenna in 1959. It should be a familiar photograph to us. However, I'd like to point out that the image, taken from the original print housed at the National Portrait Gallery in London, has more space around Plath's head than is usually seen, especially to the left. It's usually cropped much tighter. Recently published is Last Looks, Last Books: Stevens, Plath, Lowell, Bishop, Merrill by Helen Vendler. The deadline for general submissions for Plath Profiles 3 is next Thursday, 15 April. Submissions closed last week for special papers on "Sylvia Plath and Material Culture". Late submissions will be considered for publication in Plath Profiles 3, but may be held over at the discretion of the editors. If you pre-ordered your copy of The Spoken Word: Sylvia Plath from the British Library, look for this to ship next week as its publication date is 14 April. If you pre-ordered from University of Chicago Press, look for this after 20 April, its US publication date. "Three Women" debuted at the Jermyn Street Theatre in London in January 2009 and also played the Edinburgh Festival in August. The location of the theater is perfect before it's the same area Plath was familiar with during June 1953. It's four blocks by one block from the Barbizon at E. 63rd & Lexington Avenue and two blocks by one block from Mademoiselle's offices at 575 Madison Avenue. Shaw says, "I'm thrilled to be bringing our production home to the the land of Sylvia Plath's birth. I'll be recasting all the roles and I'm looking forward to working with US actors on this iconic play. I'll be in New York in May and will be holding preliminary meetings with actors at that time." Actors looking for information on "Three Women" can find it on Breakdown Express. 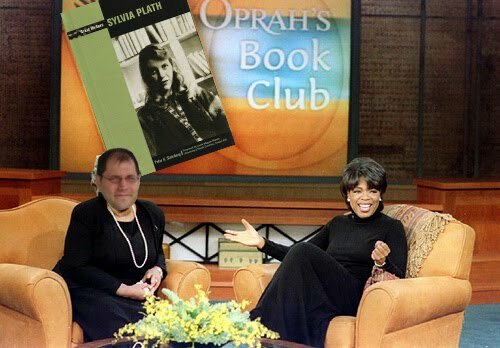 Shaw encourages anyone with a passion for Plath to get in touch via Breakdown Express. Praise from the London & Edinburgh performances. Please note the image above is not associated with the production. 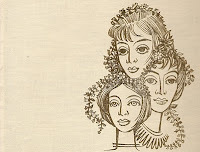 It is a detail of the 1968 limited edition publication of Three Women: A Monologue for Three Voices with an introduction by Douglas Cleverdon. I learned yesterday about "Lucent Figs and Suave Veal Chops: Sylvia Plath and Food", an essay Lynda K. Bundtzen in the Winter 2010 (Vol.10, No.1) issue of Gastronomica: The Journal of Food and Culture. The essay is on pages 79–90. CHICAGO (AP) -- Oprah's Book Club has made their 2010 selection and is set to unveil the winner when the Oprah Winfrey Show broadcasts today, April 1, 2010. In a bold move, the selection committee chose an older title which was published in 2004 and which, according to statistics, has been read by fewer than 6 people. The move to choose Sylvia Plath by Peter K. Steinberg was made, according to Winfrey, "due to Plath's iconic status not just in the literary world, but for the high quality and continuity of the self-perpetuating family drama." Winfrey added, "Like Plath said, it's 'An engine, an engine.'" The selection committee included two stars of MTV's Jersey Shore and former Illinois governor Rod Blagojevich, all of whom knows something about drama. "The Situation", illustrating some Plath knowledge, texted, "She b kool. Id frend her on fb. I rhymes alls the times." JWoww, the other Jersey Shore celebrity judge, relates to Plath, "Like me, she's a preying mantis. Bitin' the heads offa men when she done with'um" Blagojevich, seen cashing a check from Steinberg, pulled the hood of his camoflague jacket over his said, "You so can't see me now." The international panel of judges was headed by Chippy Minton, of Trumpton, who said he has been a fan of Plath, "Ever since she wrote that story about spending Sunday with my relatives in America. Quite an imagination, indeed." Liam Gallagher, formerly of Oasis and under consideration to replace Simon Cowell on American Idol, cannot be quoted here due to the unintelligibility of whatever it was he said. Endlessly proceed--and the cold angels, the abstractions.'" As is clear from the image, Steinberg had an upset stomach. "There were too many onions in the lobster pot-pie and I shouldn't have had the waffles and ice cream. But, come on, it's waffles AND ice cream." Welcome to Ted Hughes Info, aka The Blog in the Rain, a blog dedicated to the life, works and legacy of Poet Laureate Ted Hughes. Inspired by the recent news of a permanent memorial for Hughes in Poets' Corner of Westminster Abbey, this blog supersedes Sylvia Plath Info. All Sylvia Plath focused posts will be deleted by the end of the week and all sidebar links will, over the course of the next few days, be made more Hughes-specific. By 15 April, the new URL will be announced and "ownership" of the blog will be transferred to a friend, at which point also my own internet presence will be control+x'd. Daniel Huws' Memories of Ted Hughes, 1952-1963. Nottingham: Richard Hollis, 2010. Daniel Xerri's Ted Hughes' Art of Healing. Bethesda: Academica Press, 2010. Neil Roberts' Ted Hughes: A Literary Life. Houndmills, Basingstoke, Hampshire; New York, NY: Palgrave Macmillan, 2009. Ehor Boyanowsky's Savage Gods, Silver Ghosts: In the Wild with Ted Hughes. Vancouver: Douglas & McIntyre, 2009. 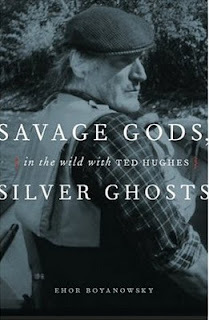 Cambridge University Press is also working on The Cambridge Companion to Ted Hughes, edited by Terry Gifford. Erik Martiny. "Replacement Anxiety: Peter Redgrove, Ted Hughes and the Wet American Dream". English Studies. 90:3. 2009: 284-293. I. Twiddy. "Community Poems: Ted Hughes and the Eclogue". English 58:222. 2009: 243-263. Coming soon will be a the official Ted Hughes Poets' Corner Memorial Design Contest sponsored by poetry patroness Abigail Westminstah.